Are you looking for an honest and reliable company that can handle all of your residential and commercial HVAC needs? The capable folks at Harper HVAC, Inc., are ready to take on the task! With more than 26 years of professional sales, service, repair, and installation experience, our family-owned-and-operated business provides exemplary heating and air-conditioning services for all your residential, commercial, and industrial needs. From single installations to complete office maintenance, we are your source for quality heating, air-conditioning, air-purifing and equiptment service at incredibly affordable pricing. 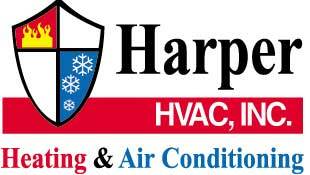 Harper HVAC, Inc., has it all! Our highly skilled technicians are company trained, certified to recover ozone-depleting refrigerant, and committed to your satisfaction. We keep up on all the latest advances in technology, so that your HVAC needs are met quickly and efficiently. Whether your problem involves a simple repair, timely maintenance, or a complete removal or upgrade of your heating and air-conditioning system, our skilled mechanical experts can handle the job. and industrial heating and air-conditioning services today!